Provide comfort for the family of Edith Bamlett with a meaningful gesture of sympathy. Mrs. Edith Lillian Bamlett (nee Howard), beloved wife of Mr. George Bamlett of Red Deer, Alberta, passed away peacefully at Points West Living, Red Deer on Friday, March 15, 2019 at the age of 93 years. Edith was born in the Arthur Nunn House in Riding Mountain, Manitoba. She moved with her parents, Percy and Florence Howard, as a young child, to Keewatin, Ontario. After living there for eleven years, the family returned to Riding Mountain. After her schooling in 1943, Edith moved to the ‘big city’ of Winnipeg, where she worked at MacDonald Brothers Aircraft, then at Eaton’s Mail Order, and at Henderson Directories. After the war ended, Edith married the love of her life, George Bamlett, on September 27, 1947. They had five children and Edith worked hard at raising them, while helping on the farm and doing the books for George’s Electrical Business. In 1969, they moved into Neepawa where the business expanded. In 1975, they moved to Eden and were semi-retired. Then in 1988/89, they moved to Calgary, Alberta. When they sold their home in Calgary, they moved into Victoria Park in Red Deer, Alberta, which is an Assisted Living Residence. When health issues arose, they moved into Points West Living, a care home in Red Deer, where George stills resides. Edith had lots of work to do and always helped out others in need .She had few hobbies but was an avid reader, loved to swim, and do crosswords. The family as a whole had a lot to do with Calvary Chapel. All of us attended weekly and mum was a Sunday School Teacher as well as helping out with whatever was happening at the time. She opened her home to bible studies and also to piano lessons being taught at our home.Edith will be lovingly remembered and dearly missed by her husband of seventy-one years, George Bamlett; her children, Ronald Bamlett, Diane Frank, John (Yvonne) Bamlett, Elaine (Don) Sangster, and David Bamlett. She will also be sadly missed by her seven grandchildren and twelve great grandchildren. She will also be fondly remembered by her sister, Dorothy Grudeski, her brother, Bill (Genny) Howard, and her sister-in-law, Irma Howard. Edith was predeceased by her parents, Percy and Florence Howard, a brother, Cyril Howard, and a brother-in-law, Leonard Grudeski. A Celebration of Edith's Life will be held at Parkland Funeral Home, 6287 – 67 A Street (Taylor Drive), Red Deer, Alberta on Saturday, April 13, 2019 at 2:00 p.m. If desired, Memorial Donations in Edith’s honor may be made directly to the CrossRoads Church, 38105 Range Road 275, Red Deer County, Alberta, T4S 2N4 or www.crossroadschurch.ca. Condolences may be sent or viewed at www.parklandfuneralhome.com. Arrangements in care of Parkland Funeral Home and Crematorium, 6287 – 67 A Street (Taylor Drive), Red Deer. 403.340.4040 or 1.800.481.7421. 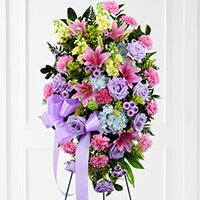 To send flowers in memory of Edith Lillian Bamlett, please visit our Heartfelt Sympathies Store. Jacqueline Howard and Family sent flowers to the family of Edith Lillian Bamlett. Jacqueline Howard and Family purchased the The FTD Blessings of the Earth Easel for the family of Edith Bamlett.